I did this walk on Tuesday 25th October 2009. I drove over to Hatfield Heath where I parked by the small car park which is located just off the main road. 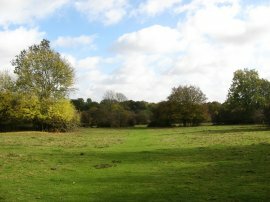 While Hatfield Heath was a little distance away from my start point on the Harcamlow Way it was an ideal place to enable a circular walk. From Hatfield Heath I headed down the Stortford Road before bearing left along the Sawbridgeworth Road, photo 1. I had been a bit unsure about walking along this stretch of road however fortunately it had a pavement running alongside and was not that busy on a Sunday morning anyway. A short distance along the road the route passes a number of houses and, just past the last house on the right I joined a rather concealed footpath that headed through the hedge and out into fields, photo 2. I followed this footpath alongside a couple of fields before joining up with the route of the Stort Valley Walk and heading to my right along a path between the fields that leads down to a bridge across the M11. Just over this bridge I linked up with the footpath where I had finished the first stage of my walk along the Harcamlow Way. 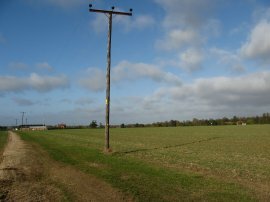 The Harcamlow Way heads across the field on the right of the photo, more or less in the direction of the shadow cast by the telegraph pole which has the footpath maker attached to it, photo 3. While the path across the field was not immediately obvious I was pleased to note the ground was considerably drier than when I had been here a couple of weeks earlier and I was also surprised by how much the crop had grown in the intervening days. From the telegraph pole the route crosses a field passing by the end of hedge before heading towards a more prominent hedge on the other side of the next field. The footpath passes through this hedge just before the left hand hedge is reached, although with the lack of any track on the ground I headed down the left hand side of the hedge and joined the road through a gateway a few yards from the correct route of the path that runs much closer to the house that is concealed behind the hedge. 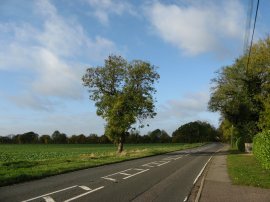 I was now back on the Sawbridgeworth Road that I had been following earlier and this time I turned to my right and headed up the road for a short distance before joining a footpath on the left that heads at angle across a field towards a small group of trees marked as Oak Spring on the map. 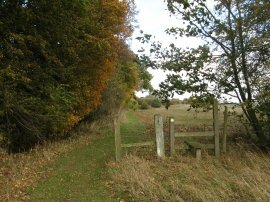 On my map the footpath is shown as running along the edge of the trees however there is a broad track running among the middle of the trees which is signposted as the path. Reaching the end of the trees the route of the path as marked on the map continues between fields to reach another clump of trees which are visible ahead before turning to the left to head across the middle of a large open field, however on the ground the footpath is marked as heading to the left along the field boundary at the point the path exits the trees which is a much better choice of route. Photo 4 was taken looking along this stretch of path. 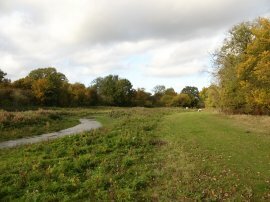 The route follows the left hand edge of a small watercourse that runs between the fields before joining a footpath on the right that heads through a small patch of scrubby ground and out into a field. 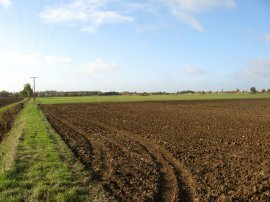 The route follows the right hand edge of the field, heading directly towards the motorway, before turning at right angles and heading to the left across the field towards the third telegraph pole from the right. From the telegraph pole the route then heads diagonally across the field towards the motorway to join a road. Here the route turns to the right to pass under the motorway before turning left along the driveway of the Hallingbury Hall Equestrian Centre. 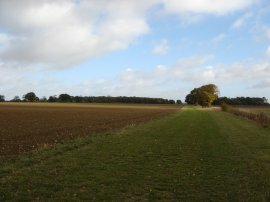 The route heads along the edge of a number of paddocks before heading out alongside a number of more open fields as the path heads gently uphill, photo 5. The route follows a fairly straight course before bending to the right to pass through a short tree lined stretch of track. At the end of the trees the route heads to the left along a field boundary but, as seems to be becoming a habit on this walk, I went off course continuing ahead before joining the route of the Forest Way and continuing on to Ryes Farm! Having retraced my steps and got back on track I continued along the field edge before passing through a gateway that leads to the edge of the open land at Woodside Green, photo 6. The route joins Goose Lane, running along the edge of the Green before heading to the right across the open ground to cross a road close to the far right hand corner of the open space. Here the Harcamlow Way joins another footpath that runs along a field edge before crossing diagonally over another small field to reach a path that runs along the right hand edge of Whitegate Plantation. Reaching the end of the trees the path heads across a small area of open ground before crossing a stile and heading along the edge of a narrow field to reach the road at Hallingbury Street. Here the path crosses over the road and continues ahead along a driveway before joining a footpath that runs up to a fishing pond, photo 7. 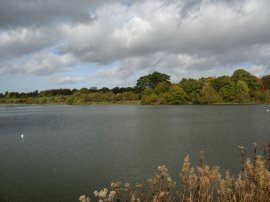 The point where the photo was taken is where a Korean Airlines Jumbo Jet had crashed in December 1999 after taking off from Stansted airport, although there is no evidence of this on the ground now. 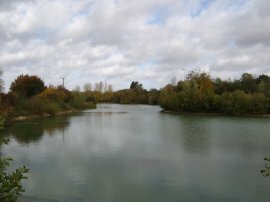 The footpath then follows the banks of the pond before turning to the right along the driveway of a house. Heading past the building the route passes through a gate into the grounds of Hatfield Forest. 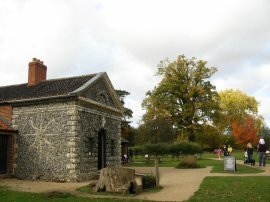 Hatfield is the only remaining intact Royal Hunting Forest from the time of the Norman kings, and is now maintained by the National Trust. I went off course a number of times as I made my way through the forest, although I was always heading in generally the right direction. After heading along a path running through trees I reached a more open area, photo 8, where I turned half right and headed down towards a driveway that leads to the main car park. It was a relatively pleasant day and the area around the car park and nearby tea hut was full of people. I stopped and had my lunch, sitting on a small lump of rock close to the Shell House, photo 9, all the benches and tables being occupied. After lunch I joined a path that made it's way round the bottom of the lake, photo 10, before heading along a boardwalk that runs through a patch of trees and out into more open ground. I then followed a driveway to a parking area at the edge of the forest where I turned to the right down road, once again slightly off the precise route of the Harcamlow Way which is marked on the map as meeting the road a few hundred yards to the South. 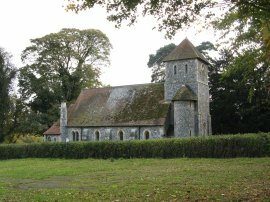 Heading down the road I passed the St John the Evangelist Church at Bush End, photo 11, before turning left along the road that leads gently downhill towards the hamlet of Bush End. For almost all the distance of the first two stages I had walked along the Harcamlow Way I had also been following the route of the Three Forest Way however in Bush End the two routes diverged and I finally reached new ground. The Harcamlow Way joins a footpath off to the left where, after having headed across the first field to reach a stile, photo 12, I finished my walk along the Harcamlow Way for the day. At this point, including the minor diversions earlier in the walk I had walked 8.35 miles along the path. As mentioned above at this point I had at last got off the paths I had walked before and the field boundary was also just past the boundary between the Ordnance Survey Explorer maps 183 and 195 so it made an ideal point to stop for the day. 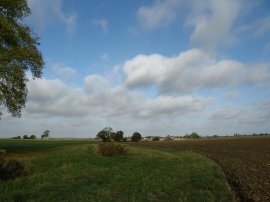 However I still had to get back to the car and thus I turned round to retrace my steps back to the road in Bush End before once again re-joining the route of the Three Forests Way which I followed as far as Hatfield Broad Oak. 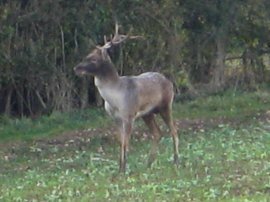 On the way I spotted the stag in photo 13 although by the time I was able to get my camera out it had run quite some distance away. 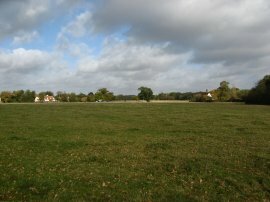 For much of the distance to Hatfield Broad Oak the footpath runs over fields alongside the course of Pincey Brook. Since I had last walked this stretch of the path the course of the brook has been rerouted along a new course running through the middle of a broad open field, photo 14. 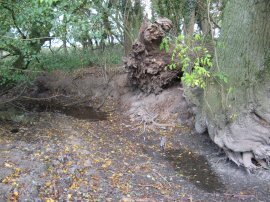 Previously it had run just inside the trees that are to the right of photo 14, and the old watercourse which had been blocked off by a bank of clay was more or less completely dry apart from a few puddles, photo 15. Reaching Hatfield Broad Oak I headed down Cage End before turning to the right down New Bury Meadow to join a footpath that runs over fields to join the B183 on the outskirts of Hatfield Heath from where it was just a short walk down the road to my parking place in the centre of the village. Reaching the car I had walked a total distance of 14.6 miles.